It is always beneficial to be aware of our roots, our history. 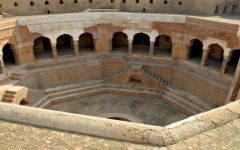 India is one such country where, even though modernization hit long ago, the charm of the bygone era is still intact in the form of ancient forts and historical monuments spread all across the country. Vadodara is one such destination that was home to many famed majestic kingdoms who wrote many rustic pages of Indian history. For all the history buffs, this city is one of the best kept secrets among the never ending list of historically acclaimed sites and here are some of the locations that are a must visit. Dating back to the era of Gaekwads, Makarpura Palace is not only a historical place to visit in Vadodara but also the pride of the city. With an impressive Italian architecture, the place served as the summer palace for the Gaekwads from 1870. Located on the Panigate Road, this now serves as the training school run by the Indian Air Force. For the history buffs planning to visit Makarpura Palace, the place is for visitors from 9am to 6pm only. Champaner-Pavagadh Archaeological Park, a proud member among the list of UNESCO World Heritage Sites, is one of the must visit places in Vadodara. Tucked amidst the serene Pavagadh hills, this park carries immense historical significance. With a blend of Islamic and Hindu architectural design, this attraction is a real treat to the eyes. Located at Vinoba Bhave Road in Sayajigunj, Sayaji Gardens is a scenic spot you will come across while in the city. Sprawling over a vast expanse of 45 hectares, Sayaji Gardens is a beautiful lush green area, which was named after Maharaja Sayajirao Gaekwad III. The garden is home to more than 100 types of flora. Apart from this for the entertainment of the visitors, there is a zoo, museum, a planetarium and a toy train open for rides. Standing for the Electrical and Mechanical Corps, the folks who built it, EME is a popular spiritual place to visit in Vadodara. With a remarkable architecture, this place also attracts art lovers from all across the country. Dedicated to Lord Dakshinamurthy, a form of Lord Shiva, it is a spiritually acclaimed location in the city. 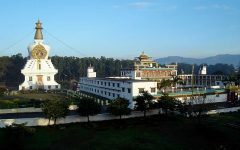 The temple is encircled by a lush green garden, which is adorned with hundreds of statues that depict the ancient history from 6th to 16th century. 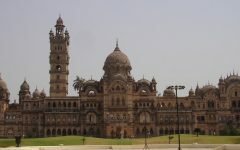 From the spiritual history to the royal kingdoms of Vadodara, the Vadodara Museum & Picture Gallery depict the historical significance of the city in a nutshell. This museum was built by the Gaekwads approximately around 1894 AD. The main highlights are the artefacts depicting the archaeology, geology, natural history and a variety of personal collection by Maharaja Sayajirao III. This paradise of art and history enthusiasts is located at Dak Bunglow, Sayajigunj in Vadodara. 10 Places Not to Miss Out on When You’re in Vadodara!